Books can take many forms, from the very simple to the very complex. 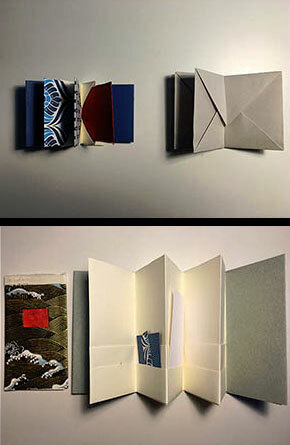 In this workshop led by Bette Bonder from Art Books Cleveland, you'll make two simple book forms: accordion and blizzard books. Each is easy and quick, but both can be decorated or modified for many uses. Call 216-875-9734 or email Barbara Loomis to register. Mr. Rickey Tax is the featured guest of Octavofest 2016. He is the Head Librarian and Acting Director of the Museum Meermanno, the Dutch Museum of the Book. The Meermanno, in The Hague, The Netherlands, established in 1848, is the oldest book museum in the world. Call 216-875-9734 or email Barbara Loomis to register for this free lecture. This year's Octavofest theme is "100," and the Michael Schwartz Library in partnership with the CSU English Department presents the "Shakespeare in Cleveland" exhibit to celebrate 400 years of Shakespeare. The exhibit includes images from Cleveland Memory, a scale model of the Globe Theater, and more. This year’s program is made possible, in part, by the Ohio Humanities, a state affiliate of the National Endowment for the Humanities. Any views, findings, conclusions or recommendations expressed in this website do not necessarily represent those of the National Endowment for the Humanities. Posted 2016-09-28 07:36:13 by Lauren_Felder.